Everything! Note the fact the chrome gold pieces as shown on the box ARE NOT CHROME! Lego is getting some hate mail today! Don't buy it. It's crap. The fact that the chrome gold pieces, as shown on the box, ARE NOT CHROME! Lego has scammed me! This is FALSE ADVERTISING and must be rectified! Your product DOES NOT match what was shown and therefore why I decided to purchase this product! I bought it solely for the new chrome gold bars pieces and when I opened my box what did I find. Non-Chrome pieces! And the gold chrome coins were of course also not chrome. This product is a hoax! A lie! A falsehood! Lego must recall, replacement, or other wise notify and rectify this to all customers. Lego should be willing to fix this by: customers may get their money back at store purchased with receipt (if not Lego Store or S@H) even if box is open and half the pieces are missing, a credit to their VIP account for the full value of the set if purchased at Lego Store or S@H, or if customer emails Lego's customer service /complaints or missing pieces and asks for the proper parts that are shown to be chrome on the box, to be shipped to them free of cost. I’ve seen slight box errors like this in the past. I understand products and factory procedures change, but to introduce a new piece (the gold bar brick) and then to have it not be what it appears to be is simply robbery to the fan community. You literally suckered me into buying this based solely on a single new type and color of piece that is NOT in this product. Well written. Way to take the innitiative. Hopefully they'll listen because I want actual chrome gold bar pieces too! Crazy thing is they even had a mat chrome "gold crystal" piece in this set. I would been happy with mat chrome but they showed glossy chrome and then put "gold-ish" pieces in the box! Flopping blastards! Edit: Moved to front page. I think the whole community needs to know not just the Guildies. I was excited for the gold bars, but I guess unless TLC changes them to chrome, I won't be buying any. Rest assured Rook, with a well written complaint letter like that you should receive replacement Chrome versions of the coins and the bar. There is a thread on the Brickset Forums dedicated to this falsehood and the people who complained were given chrome gold bars as well as chrome gold coins courtesy of TLC. I hope you are compensated in the same way. You know You CAN get your money back right? I know its not the point but you still can get your money back for this at your new local lego store. Nice, you should add a poll about the chrome dealio and make it the front page poll! Ah what a ripoff. Thanks for notifying us Rook. Also, please do tell us if LEGO does something to your complaint. I'd like to know what they're going to do. Troopa Daisy wrote: Ah what a ripoff. Thanks for notifying us Rook. Yeah, that would be quite interesting. All lego is now is basically making cheesy sets for an expensive price. Location : Choking Lord Vader. superstormtrooper wrote: All lego is now is basically making cheesy sets for a expensive price. Yes, that is because $20 is way too overpriced for this set. I couldn't agree more. I am not defending them but this figure does fall under the licensed $20 sets. 4 figures and just shy of 160 pieces. 2 figures with new hair pieces and the fact that its licensed forces them to cut back on the amount of pieces. 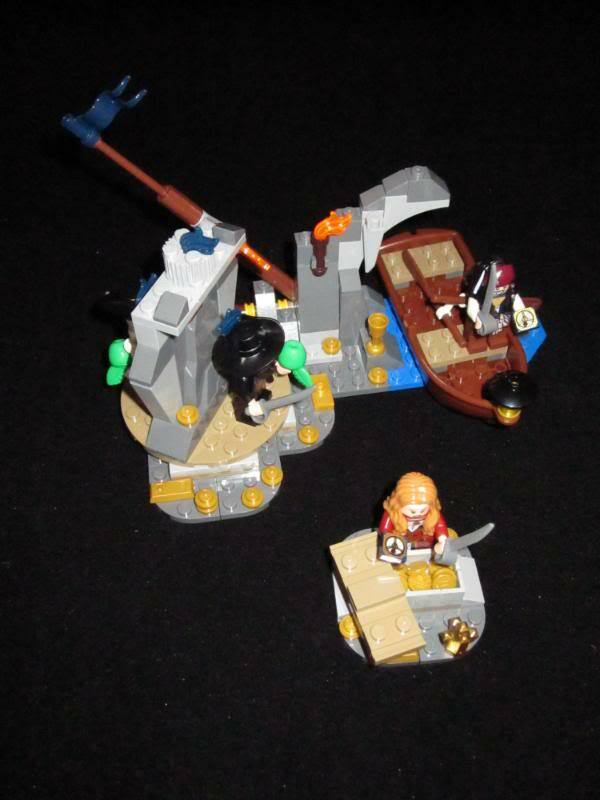 None licensed sets are about 180 pieces. I really don't understand the use of the fake gold pieces though. Does ANY of the sets use the chrome gold pieces? You would think that for a pirates set, especially one with movie reference, you would go with the gold. Rook do you have a main contact at Lego? If you want I can find out about our contact at Lego and send it directly to him. I got some lame response from customer service. Basically they have the coins in chrome but not the "new gold brick" pieces. So unless they can get me the new gold brick pieces in chrome then my verdict stands... Thieves! Rook wrote: I got some lame response from customer service. Basically they have the coins in chrome but not the "new gold brick" pieces. So unless they can get me the new gold brick pieces in chrome then my verdict stands... Thieves! Someone on flickr seems to have had better results. Not sure if that helps you at all. All they set me was chrome gold coins. No chrome bars. Rook wrote: All they set me was chrome gold coins. No chrome bars. BARNACLES! I too want gold bars.